Lee Johnston and Carl Frampton. 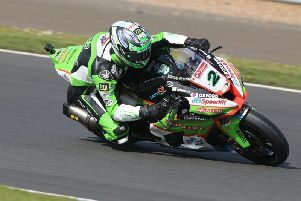 Boxing star Carl Frampton and top road racer Lee Johnston will take part in a special event at this year’s MCE Ulster Grand Prix to raise funds for the F13K Cancer charity. ‘An Evening with Carl Frampton and Lee Johnston’ will be held place in the hospitality marquee on Wednesday, August 9, just days after Frampton’s highly anticipated fight at the SSE Arena in Belfast against Mexican Andres Gutierrez. Lee Johnston pictured at this year's Isle of Man TT. Johnston and the ‘Jackal’ became friends after the multiple international road race winner visited Frampton as he trained in London just over a year ago. The duo will be interviewed on stage by BBC NI’s Mark Sidebottom and all funds raised will go towards F13K Cancer and Marie Currie. Tables of 10 can be booked for a minimum donation of £200. Frampton said: “When the Conlon brothers & the JDM Group invited me to take part in this event I didn’t have to think twice. “I have been friends with Lee now for over a year and I have enormous respect for both him and motorbike racing. Johnston, who missed the Dundrod meeting last year through injury, expects the event to be a massive hit next month. “I’m really happy that Carl has agreed to get involved. He’s a great guy at the top of his game and getting such a big name from another sport will help keep the charity in the spotlight and hopefully raise plenty of money as all proceeds will be donated,” he said. Ulster GP Clerk of the Course Noel Johnston said he initially planned to host the event last year but is delighted everything has fallen into place in 2017. “We’re pretty excited about this and it’s something we wanted to see happen last year, but the timing didn’t work out as Carl went on holiday immediately after his big fight against Santa Cruz,” he said. “However, I do think that this will be worth waiting for and the craic will be mighty for those lucky enough to get a ticket for the event. It’ll be the first opportunity for many fans to hear from the Jackal after his big homecoming fight on July 29. Tickets for An Evening With Carl Frampton and Lee Johnston are available to purchase from JDM Management on 028 9066 5664 or by emailing office@jdmmanagement.co.uk.